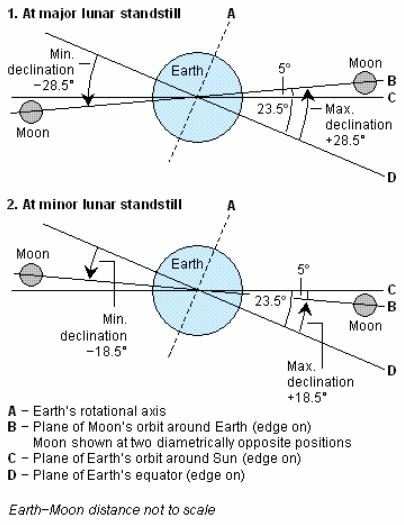 ‘The major standstill limit of the moon can be reached if the lunar node is near the vernal (or autumnal) point, and with the moon at its max. distance from the equator, equal to a declination at present days of 23.44° + 5.1454°= 28.59°. This number leads to the key to the puzzle. So Earth is now near the mean of its min. and max. angles of tilt. The lunar data results above all cluster round 1.118034, which is also the square root of 5/4. Declination – minimum:geometric mean ratio is 5:4 approx, and g. mean:maximum ratio is 4:5 approx. So the fourth root ratio mentioned earlier (standstill limits) is the result of two square roots.